Adrian Taylor introduces an Asian catfish of the month this month. When not writing articles for this site, he's busy running his own and you can check it out at hillstreamcatfish.com. This graceful Asian brown coloured catfish can on occasion be found in our local stores every few years or so and at an affordable price. Unfortunately many inexperienced aquarists make the mistake of purchasing more than one and adding them to their community tank. Apart from the fact that they will predate on very small fishes, they do have a rather sinister side to them. 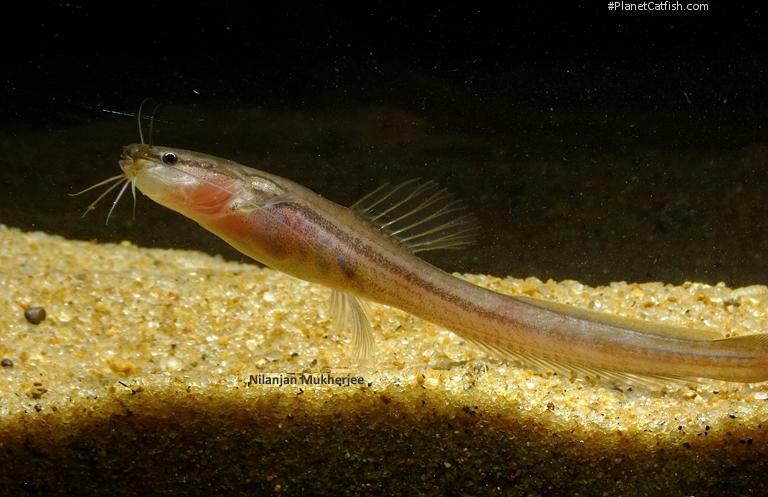 Their common name of ‘Fighting Catfish’ is well deserved, as these smallish, elongated catfish which only grow to a maximum of 110mm standard length, are exceptionally hostile and intolerant towards any other of their kind up to point of causing their demise. However; they will cohabitate quite peacefully with similar size fishes in the community aquarium. Olyra longicaudata is wide spread throughout Northeastern India, Western Bengal & Assam; Northern Myanmar and through into Thailand. An ideal aquarium setup into which one can keep these feisty fighting catfish, would be one having a substrate made up of fine rounded gravel or sand, with small area’s of rocks or bogwood which have plants attached to them like Anubias and Java fern and small clumps of aquatic plants well rooted in the substrate such as Cryptocorynes. Temperatures of around 20°C to 25°C (68°f to 27°f) a hardness of around 12°dGH and a pH of between 6 and 7 should also be provided, and as these are a Catfish that originate from medium fast to fast flowing rivers it is essential therefore that the water in the aquarium also has a good flow to it. One way that this can be achieved is by using an internal power filter. Olyra longicaudata is a species that likes to forage for food in the twilight time’s, and therefore feeding is best undertaken just prior to turning off the aquarium lights; live foods such as bloodworms, white-worms, small earthworms and similar size organisms should be fed as these are a species that in most cases will ignore prepared commercial foods, although they will happily feed upon frozen foods such a Bloodworms, Mysis shrimp and adult brine shrimps. Olyra longicaudata has at present not been bred in captivity and apart from females looking slightly more rotund when they are carrying eggs there are no known sexual differences. Other species of this family include Olyra burmanicus, Day 1872; from the Pegu Yomas area of Myanmar. Olyra horae, (Prashad & Mukerji, 1929; from the indawagyi lake & Myitkyina area of Myanmar. Olyra kempi, Chaudhuri, 1912; from the Assam district of India. Etymology Olyra: From the Greek olyra, meaning a kind of grain (probably rye); probably in allusion to the shape of the fish. The specific epithet comes from the Latin longus, meaning long and cauda, meaning tail; in reference to the extremely long caudal fin. Identification The bagrid catfish genus Olyra is known from the Ganges-Brahmaputra river system in the northern part of the Indian subcontinent. It is also known from localities southwards to the Manimalai River in southwestern India and eastwards to the Mae Klong River drainage in western Thailand. The genus is a supported monophyletic group diagnosed by the following combination of external characters: anguilliform body; unossified first and second dorsal-fin elements; and greatly enlarged upper caudal-fin lobe. Distinguished from congeners by the extremely long upper lobe of the (forked) caudal fin. The populations from the Tenasserim region in southern Myanmar and the Mae Khlong drainage in western Thailand may represent distinct species. Distribution Northeast India, possibly to Myanmar and western Thailand. Other Parameters Strong current preferred. Furniture Tank should be furnished with rocks and one or two pieces of driftwood. The rocks should be arranged such that enough crevices are created for the fish to hide in. Compatibility Compatible with most other community fish. Congeners are extremely territorial and will fight, even when placed in a large tank. Best kept in an Asian hillstream biotope with fast-water cyprinids (e.g. Barilius or Danio) and loaches (e.g. Schistura).